Welcome to the website of Darren Irwin’s research group. Our research is directed toward understanding how new species arise, how geographical variation within species is produced, and how behaviors evolve. We study carefully chosen model systems using an integrative approach, employing techniques such as genomic analysis, computer-assisted analysis of vocalizations, observation and experimentation in the field, and computer simulation. Research systems have included passerine birds in Asia, Europe, and North America, and salamanders and sea otters of the Pacific Northwest. Interested in joining the lab as a postdoc or graduate student? Click here for more info. Analyses of genomic differentiation between related species or forms often reveal distinct regions of the genome with much higher relative differentiation (FST) compared to the rest of the genome. There are a variety of theories to explain this pattern, including (1) that the regions contain “speciation genes” that produce partial genetic incompatibilities when heterozygous, preventing gene flow between the forms at that part of the genome, and (2) that there are different alleles that underwent selective sweeps within each population while not in geographic contact. 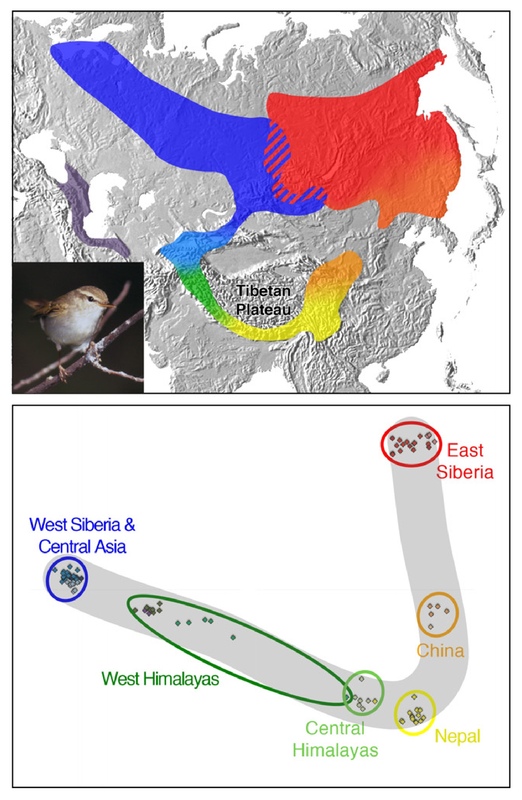 In analyses of Swainson’s thrushes (Link), greenish warblers (Link), and several pairs of North American warblers (Link), we have shown that regions of high relative differentiation usually have low absolute nucleotide distance, leading us to develop a new “sweep­-before­-differentiation” hypothesis: globally favorable mutations may have swept between populations, and these regions have then undergone differentiation. Former Ph.D. student Dr. Alan Brelsford (defended July 2010; now Assistant Professor at UC Riverside) studied molecular, phenotypic, and behavioral variation across the hybrid zone between Audubon’s warblers (left) and myrtle warblers (right), two forms of yellow-rumped warblers. He found that the hybrid zone is stable, and that there is some form of selection against hybrids maintaining the zone (PDF). 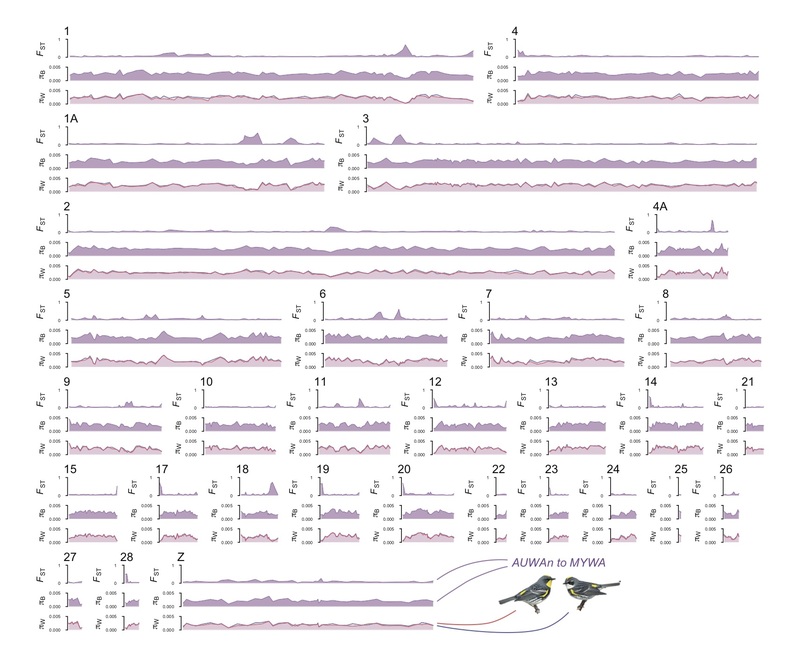 Alan also led a study of genetic variation throughout the entire yellow-rumped warbler complex, showing that the Audubon’s warbler most likely originated through hybrid speciation (PDF and News and Views). 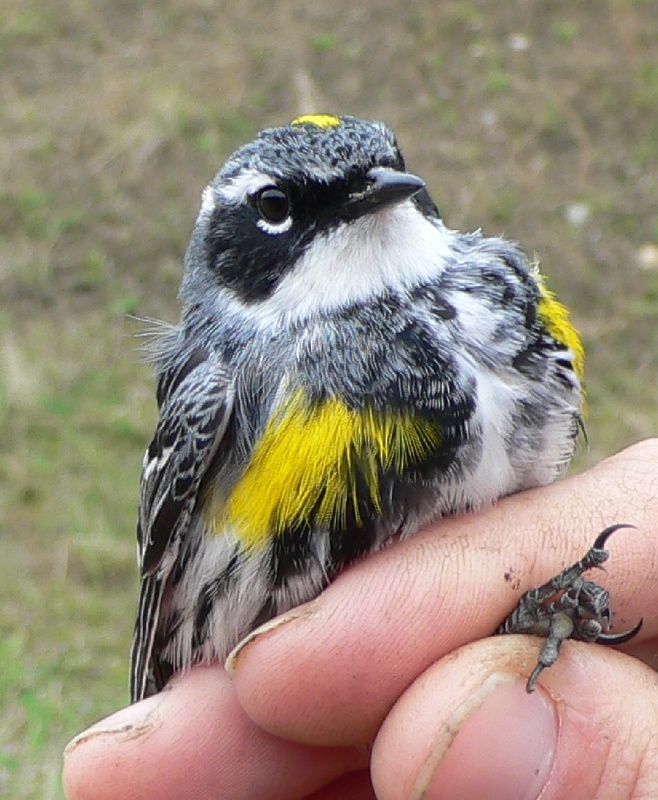 Former Ph.D. student Dr. David Toews (defended April 2014) expanded the scope of our lab’s work on yellow-rumped warblers, examining the association between migratory behaviour and genetic divergence in both the southwestern USA and the Canadian Rockies. 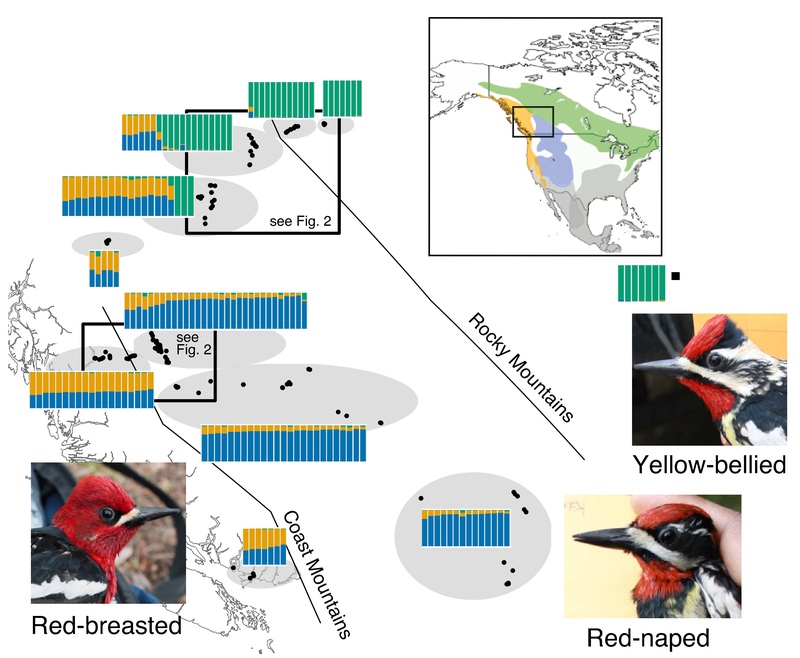 More recently, we have mapped the pattern of genomic differentiation across the genome and identified genomic regions underlying plumage differences (Link1, Link2). 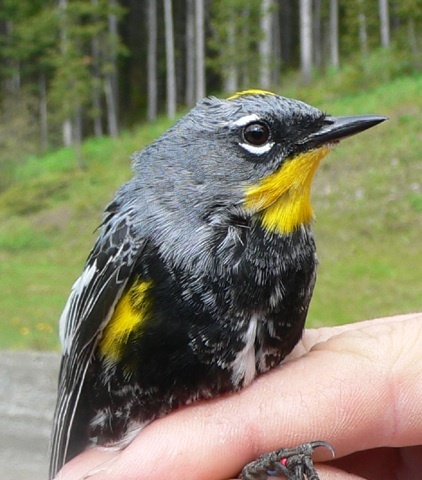 We discovered a hybrid zone between MacGillivray’s and mourning warblers in northeastern British Columbia. At right is a hybrid (a “MacMourning warbler”) identified using molecular markers (PDF). We have also discovered a hybrid zone between Townsend’s and black-throated green warblers (at left is a hybrid) in the same region (PDF). PhD student Silu Wang is now studying the hybrid zone between Townsend’s and hermit warblers. Postdoctoral scholars Dr. Sampath Seneviratne and Dr. Christine Grossen studied genomic variation among three hybridizing sapsucker species in western Canada (see below) (Link1, Link2), and PhD student Libby Natola is now studying that system in more detail. Former PhD student Dr. Saminda Fernando studied another woodpecker hybrid zone, between two forms of flameback woodpeckers in Sri Lanka (Link). Mitochondrial DNA (mtDNA) is often used in studies of phytogeography, but the patterns in mtDNA and nuclear DNA often differ (a pattern called “cytonuclear discordance”). One possible reason is natural selection: variation in mtDNA is often assumed to be neutral to selection, but given the linked inheritance of mtDNA genes and their vital roles in metabolism it is plausible that selection plays a role. 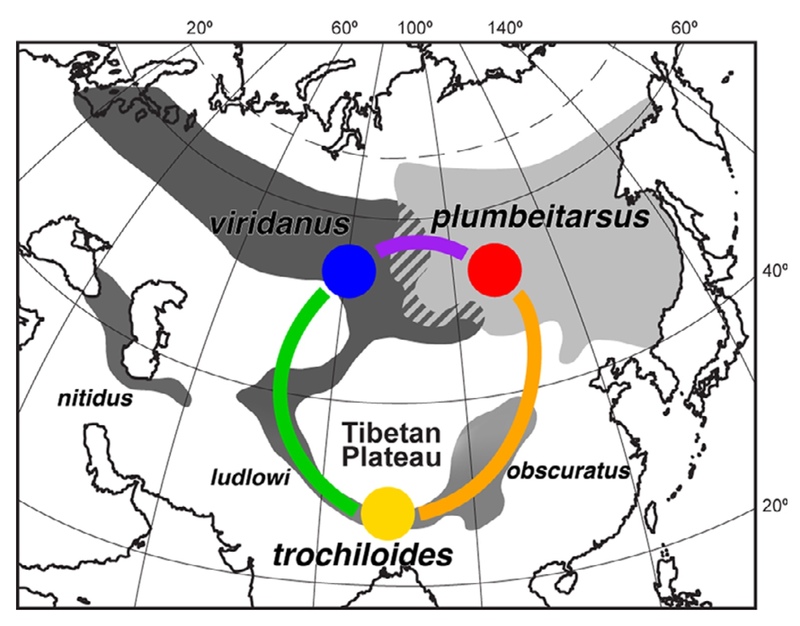 We have published theoretical examinations of why mtDNA can show phytogeographic structure (PDF1, PDF2), and a our studies of natural variation in mtDNA have also produced evidence consistent with adaptation of mtDNA (PDF1, Link2, PDF3). Greenish warblers in Asia show how geographic variation can be used to reconstruct how two species can arise from one. Click here to learn more about this ring species. Collaborators include Trevor Price, Staffan Bensch, Jessica Irwin, and Miguel Alcaide. 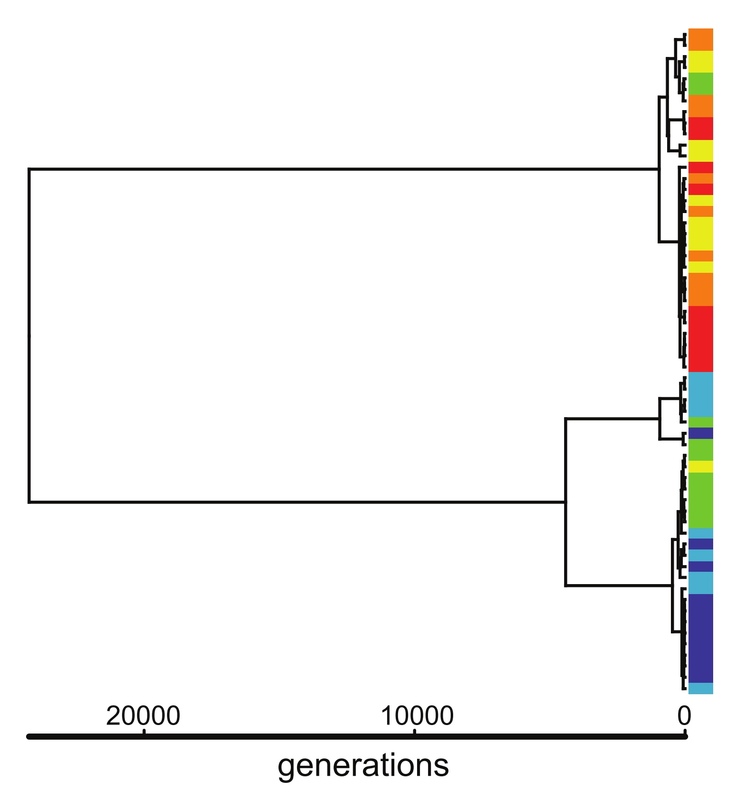 Early work on this system emphasized song and mtDNA variation (PDF, PDF). 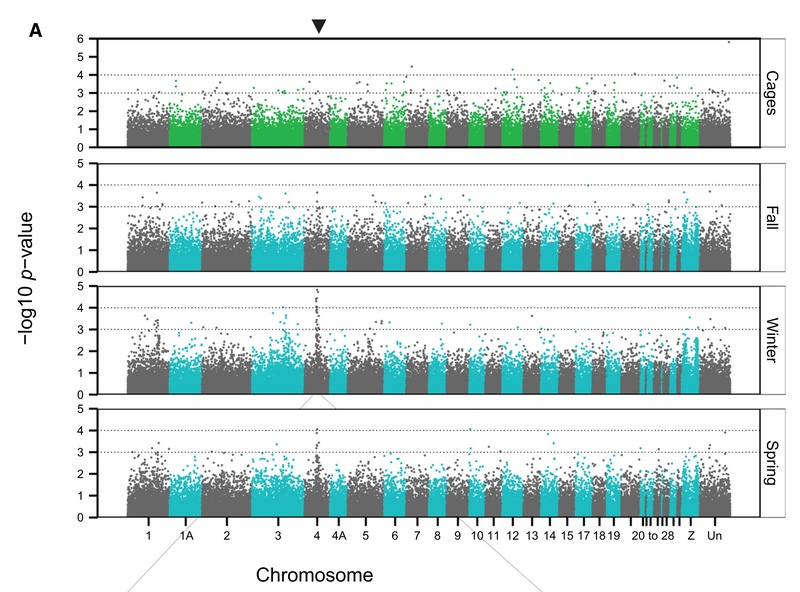 More recently, we have used genomic analysis to clarify patterns of relationships around the ring and to infer the role of introgression and parallel selection in causing islands of differentiation (Link1, Link2). For general discussions of ring species, see Link1, PDF2, Link3, and Link4. 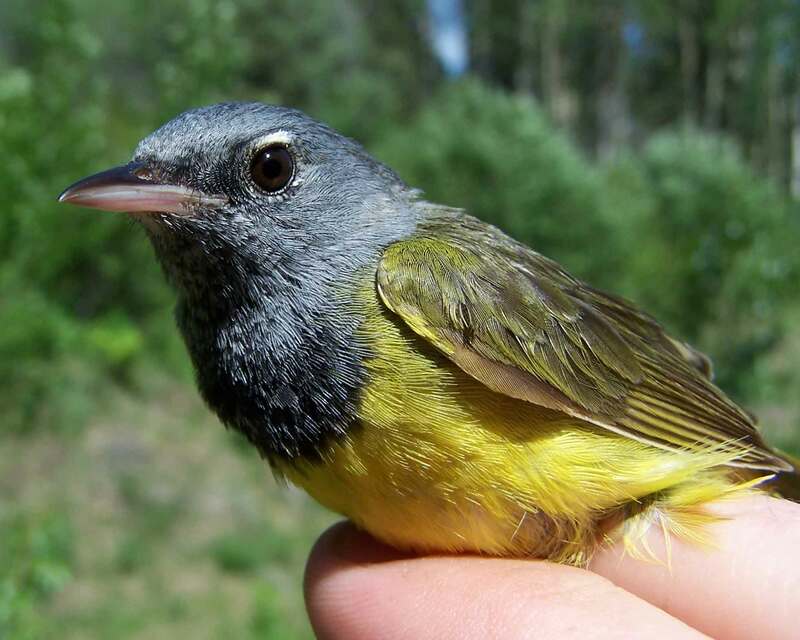 Starting in the 1960’s, cage­based orientation experiments suggested that there is a genetic basis for seasonal migratory behavior, generating the prediction that different migratory behaviors might play a role in speciation. Research led by former PhD student Dr. Kira Delmore has succeeded in performing the most complete test of this hypothesis. Using tracking devices (light-level geolocators) to measure migratory routes, we demonstrated that two forms of Swainson’s thrush on either side of a hybrid zone take very different routes to their wintering grounds (PDF1), with hybrids having intermediate or mixed routes that are likely inferior in terms of both navigation (e.g. mountains) and food ability (e.g. deserts) (Link). 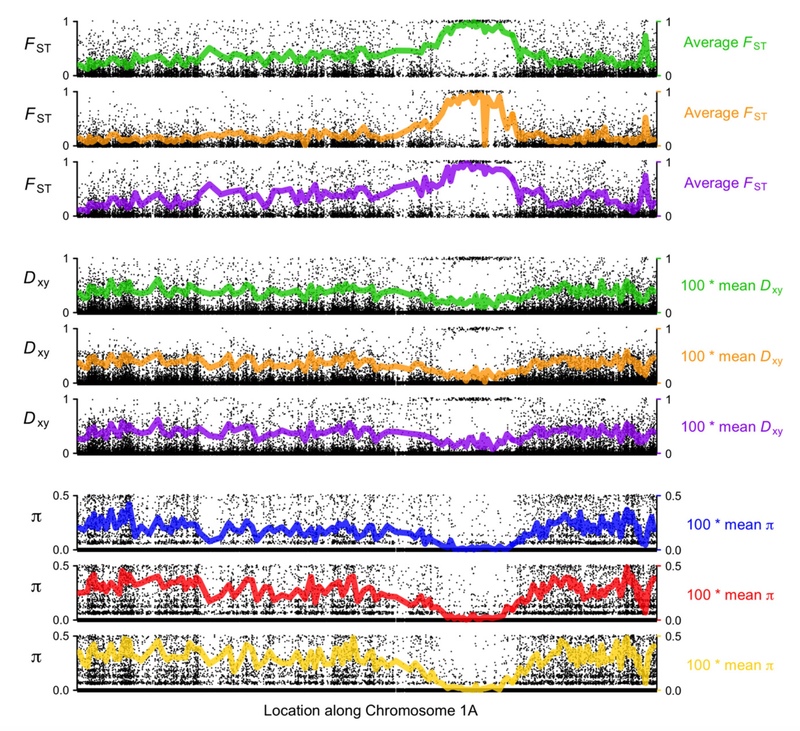 We then assembled a Swainson’s thrush genome and conducted genome-wide association analysis demonstrating that a segment of roughly 60 genes on chromosome 4 explains a large percentage of the variation in migratory routes in the hybrid zone (Link). 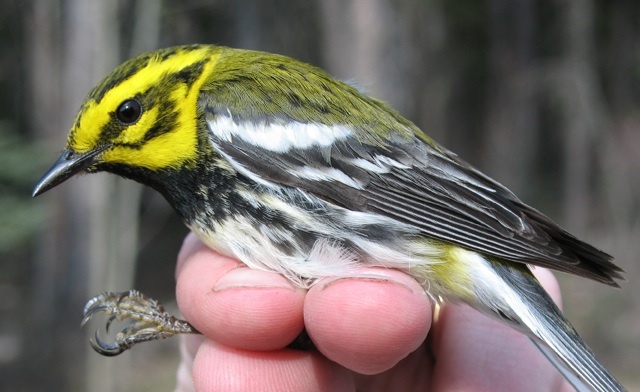 We have also produced a number of literature reviews on the topic of migratory divides, showing that they are common in both Eurasia (PDF) and North America (PDF), and conducted analyses of migratory connectivity and its relation to speciation in Wilson’s warblers (PDF1 and PDF2). 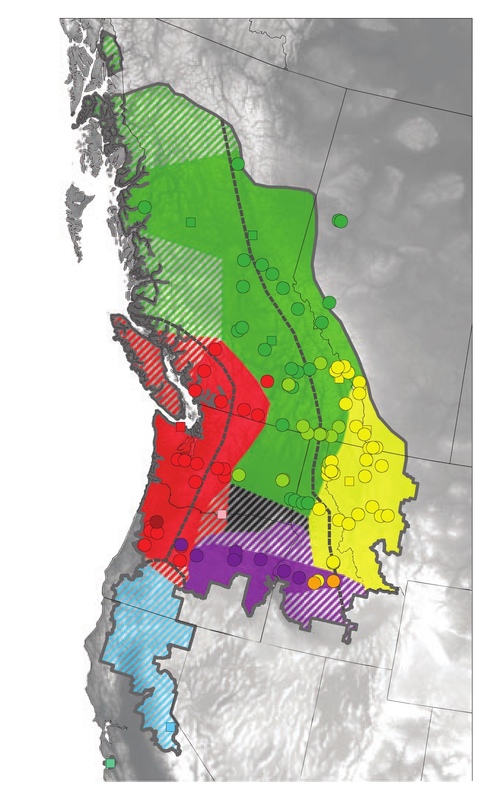 In northeastern British Columbia, near the town of Tumbler Ridge, we have found a contact zone between distinct western and eastern forms of winter wrens. These forms differ dramatically in songs and genetics, and the two forms are reproductively isolated (PDF). Dr. David Toews (who did his M.Sc. on this system) and I proposed that the western form be elevated to species status as the “Pacific wren.” In 2010 the American Ornithologists’ Union officially recognized two distinct species in North America: the Pacific wren (Troglodytes pacificus) and the winter wren (Troglodytes hiemalis), both now distinct from the Eurasian wren (Troglodytes troglodytes). Click here to learn more, and to listen to their songs. We have also contributed to elucidation of cryptic species in Asia (PDF). Former PhD student Dr. Julie Lee-Yaw found that there are a number of cryptic lineages of long-toed salamanders, and these meet in narrow contact zones where there is some mitonuclear discordance (PDF1, Link2, Link3). Congrats to Madelyn Ore, M.Sc.! Comments Off on Congrats to Madelyn Ore, M.Sc.! Congrats to Kenneth Askelson, M.Sc.! Comments Off on Congrats to Kenneth Askelson, M.Sc. !